Technological advancements are always helping humankind to save the precious time and to comfort you. Each and every day, new products are released to catch up with the transforming demands of the world. Engineers are serving day and night to sort out the requirements and make everything in concordance with your prioritized requirements. Plantronics Earloop Eargel Kit for Blackwire 435 is a similar product which is designed specifically to fit your preferences. The product is a black wire ear loop along with ear gel kit. 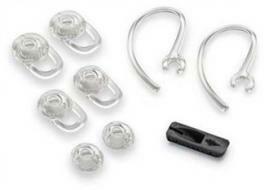 It is further equipped with three soft ear gel buds and two different sizes of durable ear loops. To provide you with more leisure and support, an additional soft foam ear loop is designed which slides onto any ear loop.